(CHARLESTOWN,NEVIS–MONDAY, APRIL 18TH, 2011) Premier of Nevis, the Hon. 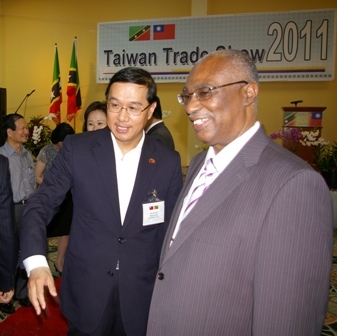 Joseph Parry met with Resident Ambassador to the Republic of China on Taiwan His Excellency, Miguel Li Jey Tsao during the opening of a two-day Taiwan Trade Expo at the Royal St. Kitts hotel on Friday. After visiting the many stalls at the Expo, posing for pictures with Taiwanese delegates and speaking to representatives from various organizations and business places, the Premier said to the Ambassador that he was impressed with the many products that were being marketed at the Expo. 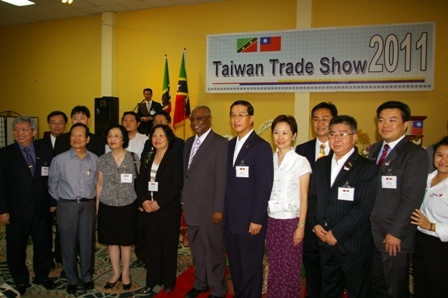 He added that promoting products from St. Kitts-Nevis in Taiwan could also be of great benefit for the island and a similar Expo should be held in Taiwan soon. Showcased at the Expo were fashion accessories, electronics, solar energy products, computers,sun glasses, furniture, locally made clothes and communication gadgets. “It is important for me to express the appreciation on the promotion of bilateral relations and business opportunities between Taiwan and St. Kitts-Nevis. I truly hope that this is a stepping stone for bigger and better opportunities for both countries in the future,” the Premier said in conclusion.